A huge 22 wheeler truck have failed brakes when it was crossing salt range on motorway M2 Pakistan. The truck getting uncontrollable and driver jump out from truck. 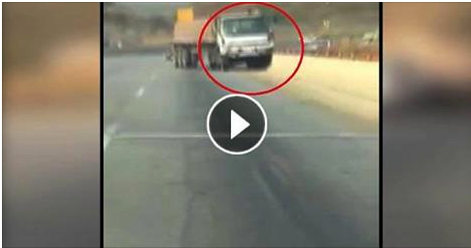 The truck was running on motorway without any driver and it was hitting the road guide wall. A family when saw that truck they start to capturing that incident. Meanwhile family head takes a very dangerous decision to stop that truck. His family stopped him to do this but he set an example to saved the other lives. He left his car driver seat and ran away towards the truck to stop it. After huge struggling he succeeded to stop it on 2 km distance. Check the video and brave man interview with family.